Phew. Full house but floodless at Guesthouse East in Eastbourne. Nature’s been very generous to Eastbourne over the festive and New Year period. 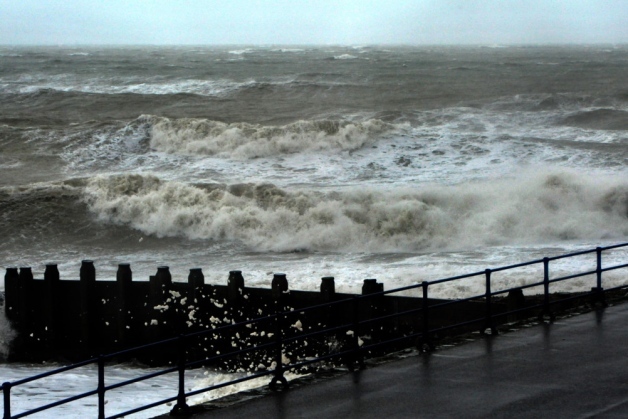 Large helpings of wet stuff and gust after gust have battered the seafront and collapsed cliffs all along the south coast. Thankfully, there have been glorious breaks in the weather to allow our guests an invigorating stroll on the prom or a hike along the Seven Sisters. Personally I haven’t made it past the new Western View cafe next to the Wish Tower, but I can’t think of a better place for a hot chocolate and fat slice of cake, facing Beachy Head with the sunshine streaking through the clouds. Our final guests have left this morning and the Christmas decorations will be taken down later and preparations made for the year ahead. I reckon the future’s bright. For us that means refurbishments, a new website (watch this space) and all round effort to help improve your experience at our guesthouse. From an Eastbourne perspective I hope we’ll make further progress towards a train service to London in 70 minutes, wiping around 20 minutes off the current service and helping drive investment locally through improved employment prospects and tourism. With two accommodation- related businesses – The Guesthouse East and Exclusively Eastbourne – I’m desperate to see improvements to the conference facilities, based around the Congress Theatre and Winter Gardens, but after a promising start, with grand designs and fanfare, progress over the last 18 months has been glacial, embroiled in (inevitable) council red tape. The joy of decision-making by committee. Still, I’m grateful that the council-maintained flood defences have remained resolute in the face of continued attack. Rejuvenated after a quick bike ride past the bandstand with the children I’m ready to sort out the decorations. Well, maybe there’s room for a quick mince pie first.